Here's a long gone compilation from the early 80s called "Tobacco A-Go-Go" which has it's focus on North Carolina's garage rock and psychedelic releases from 1965-69. Groups include The Bondsmen ravin' through a version of The Five Americans hit "I See The Light", The Barracudas "Not Fade Away" taken from their sought after album "A Plane View", The Si-Dells "Watch Out Mother" and a teenage James Taylor features in a group called The Corsayers. They perform a version of "Money" - several more of course, but for me, none better than The Young Ones "Too Much Lovin" from late 1966. "Too Much Lovin" is where's it's at, with it's infectious jangle beat and high pitched organ, they sound like a ramshackle teenaged version of The Monkees.... and I mean that as a huge compliment. This one smokes in my world. So who were The Young Ones? They were a teenage combo hailing from Lumberton, North Carolina. They won a "Battle of the Bands" competition for North & South Carolina bringing them to the attention of thousands of teens. Soon afterward The Young Ones released their first single "Too Much Lovin" / "Harbor Melon" during December 1966 which was a local success climbing to the top ten in several Cities in Carolina. This was the bands first recording. Twenty-Sixth Street refers to Dicky Britt's house. At the beginning, the sound is Dicky shaking the reverb on the farfisa organ while Carlton Warwick slides his pick down the guitar strings. 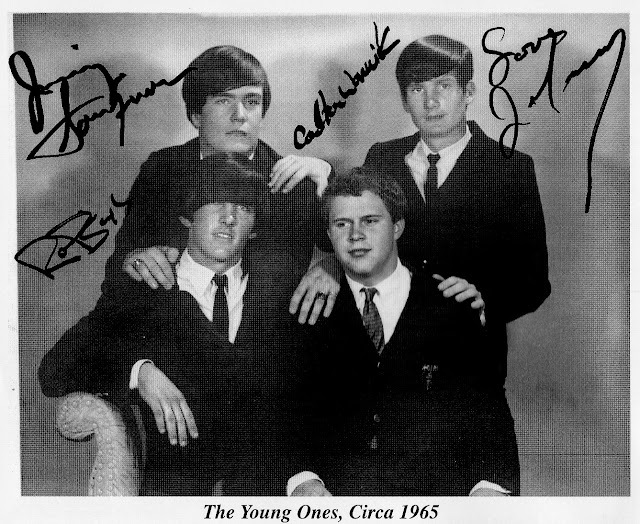 The Young Ones broke up soon after their second single was released. Jimmy Sossamon would then form a new group called The Cykle.